It’s not often that we get to see a kill while on game drive. One morning we’d stopped at a dam on the reserve to see if we’d have better luck with the birds, as the animals weren’t cooperating, when we heard a massive commotion in the reeds to the right of us. We drove over to investigate, and at first we couldn’t see anything other than a few ripples on the water. We decided to hang around to see what – if anything – had happened. Our patience paid off because we’d only just gotten comfortable when a young crocodile surfaced with a bushbuck lamb in its jaws. The lamb was already dead, so technically we didn’t actually see a kill. But then watching an animal die is not a nice experience, so perhaps it wasn’t such a bad thing that we’d missed the main event. The croc submerged again, still clutching the lamb in its jaws. When it resurfaced it only had a small piece of the lamb left in its mouth. 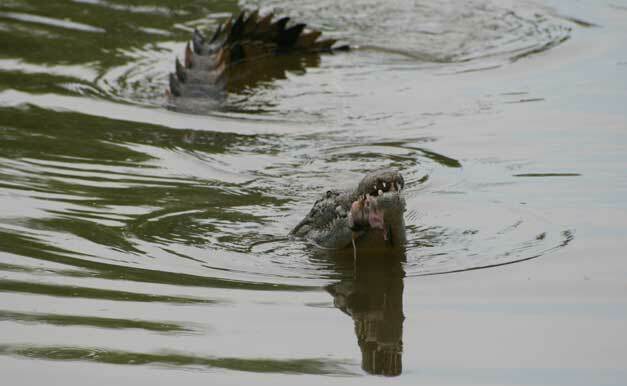 Crocodiles are not able to chew like other animals, so in order to get smaller pieces of meat off their kills they grab onto the animal and do something called the death roll. Essentially they twist pieces off by spinning around. We watched until the formidable reptile had finished the entire thing. It then made its way to a sandbank in the middle of the dam to sun itself.